Wedding albums are the added extra many people want, but when it comes time to purchasing a portrayal of their day, couples can get cold feet – especially when it comes to obtaining multiple copies for family members. So how do you overcome this obstacle? How do you sell more wedding albums? In this article, we want to give you a few tips that will help you present your album to your clients that will hopefully see them wanting to purchase multiple copies. By far the easiest way to win your client over is to talk with them beforehand to develop a personalised design. Discuss a lookbook or magazine style they like and continue this theme throughout the album pages. We even encourage you to show some of your other client work to give them a feel for what the final product would be. Ensure you work closely with your client through the proofing stage to manage their expectations and always include the photos that are important to them! In your wording make sure you include ‘gift’ as an idea for your clients to think about. A wedding album will always make the perfect gift for any family member who is interstate or in another country so encourage your clients to order additional wedding albums for these people. One way of not being too forward about the idea is to include a DL sized brochure in the form of a gift card within all wedding albums you sell. The beautifully designed gift card might provide your clients with a slight discount when purchasing additional albums for relatives or even friends. 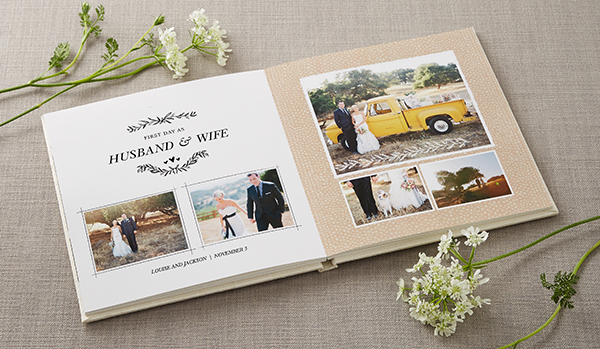 A wedding album is about highlighting the special memories of a client’s day. It is essential to think beyond the bridal party and ensure you include some candid shots of family and friends as they celebrate the day of the couple. By capturing this unseen emotion, your clients will more likely feel the wedding album has more ‘special memories’ that are worth keeping. The result may even be more orders for wedding albums as family members also fall in love with the photographs. The technology surrounding the wedding photography industry has advanced at a rapid pace, so why not use it to your advantage when presenting the album to the client? Here at Albumdraft, we help photographers like yourself present the design in a beautiful and realistic virtual presentation, so clients have a better understanding of the finished product. By adopting our platform, the couple can relive the memories of their wedding day in the comfort of their own home, which in turn will help them make a better buying decision when ordering multiple albums. As you can see, by thinking outside of the box and doing things a bit differently you will be well on your way to fulfil multiple orders for wedding albums. Continue this, and you will quickly find this part of your business will be the most profitable and memorable with each client.